The magical, mysterious world that provides the setting for Belief's Horizon has a rich history. An ancient and nearly forgotten culture, known as Bandu, lives on in some of the legends told and in some names for everyday items. One such name comes from Azmer, a Bandu god of water and meditation, whose name was chosen long ago for "Azmerian stones." Azmerian stones are found on Grith and provide a person with a short, pleasant, relaxing moment, similar to a phenomenon here on Earth in real life called ASMR. I've decided to maintain a page here on happen.net to highlight works of art that live at the crossroads of the literary fantasy genre and ASMR. I hope you find it informative and fun. Fantasy Genre ASMR. It has been a long hard winter. They said we'd have snow, what with the La Nina weather pattern and all, but no such luck. I would like a refund, please. Meanwhile, my editor is hard at work on Belief's Horizon, and I've been discovering book two. 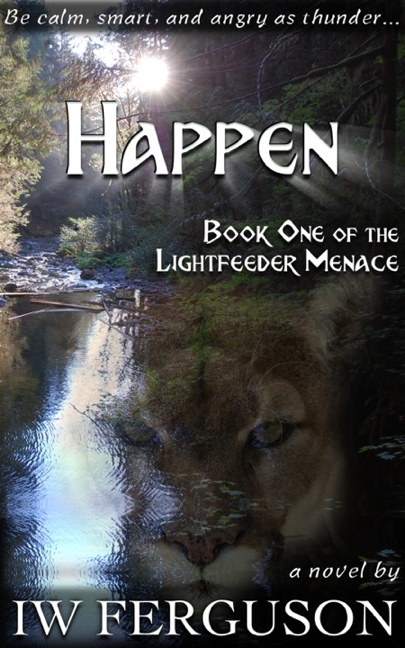 I also remembered I promised exclusive bonus content about the characters and settings from the Lightfeeder Menace series for the folks on my mailing list. So, I've set up my first MailChimp newsletter, and duplicated it here. I know that's not what exclusive means, but given the current level of traffic on this site, it's close enough. So, let's talk about tulls. Several beta readers have asked about them. When I started writing this book in the summer of 2015, I had both mules and horses playing different roles, and I did a fair amount of research. The most important thing I learned was that many successful authors have failed to accurately portray horses and their needs. Typically, characters learn how to ride immediately, travel all 200 leagues from the Dark Lord's keep to the humble homestead in less than a fortnight, and arrive fresh enough to win an archery contest, best a few wayward trolls, and pleasure the missus; all with only the occasional bowl of stew for sustenance (for the rider, not the horse). This kind of poetic license can be distracting for those familiar with the actual riding of actual horses. What's more, in a world without metal for horseshoes, how could a mule pull Happen's cart on packed gravel roads from the Irelian Peninsula all the way to the trade fair? Tulls to the rescue! Learn more about the Berythean beast of burden on the Grith beasts page. I'm not much of a people person, but since I'm starting a publishing business, I kinda hafta dip my toes into the cold, cold pool of networking. So I've been working on that, and I've already had good results. A comment I made on a blog for fans of fantasy books was chosen for an article topic, and the blogger even linked back to my website. Truly an unexpected win. The blog is Thoughts on Fantasy. The article can be found here: Must Fictional Parents Always Be Absent? I'm pleased to announce that I've chosen an editor. Her focus is speculative fiction. Her sample edit and subsequent email discussions have shown her to be awesome. And my sleep schedule doesn't inconvenience her because she's in Australia. Learn more about Kat Betts and Element Editing Services here. I'll be incorporating feedback from beta readers and finishing the next draft to deliver to her in late October. I've been thinking I'd like to have a more descriptive title. Belief is a major theme of the book: the extent of a person's belief (or, the size of their world), the extent to which what a person believes matters, how to make decisions when you know you don't have all the relevant facts, etc. I was hoping to find the scientific term describing the boundary that gets shattered (or extended) by "first contact." I'll do more research on this, but for now, I haven't found it. So I made it up: Belief's Horizon. Happy Longest Night to all! I've automated my mailing list for my newsletter using a free online service (free unless the list gets big enough that I won't mind paying). It took a fair amount of fiddling to customize it and connect it through my Facebook page, but it seems to be working and look okay (at least according to my very limited testing). Turns out I can make it look good on my setup (Firefox on a Mac) or acceptable on most popular setups. So it looks weird on Firefox/Mac, I know. Please give it a try and let me know what you think of the process. If you don't like it, it's easy to unsubscribe. Quarterly updates about my books: how the current ones are selling, how the work in progress is progressing, and how my foray into publishing and marketing is going. Exclusive bonus content. Extra stuff about the characters and settings from the Lightfeeder Menace series. Believe it or not, you can't get this stuff anywhere else. If I'm excited about a book or something related to the fantasy genre, I might mention it briefly, but I will not give anyone else access to this list. I have an irrationally intense dislike for spam, and will not abuse your trust. It's important for an author to have a robust mailing list, so you have my gratitude. I've finished the second draft, and sent copies off to my editor and ten beta readers. The manuscript looked sad without a cover, so I made one. I have a better idea for a better cover, but it's fun to have one for now. I started writing it in the summer of 2015, and I've just finished the first draft. Still working on the name, though. It's the first in a series (3 or 4 books probably), but I haven't named the series yet, either. I'm finding that naming and describing it is much harder than I thought. But if you're curious, the first chapter is available as a PDF here: Chapter One (PDF). Here's a very rough attempt at a short description: "Happen Fell is leaving home for the first time, to finally start creating his own story. He’s inherited a family responsibility that leads to danger, but with help from two aliens and a charming fortune teller’s apprentice, he finds his first chapter could play a role in a much bigger story, one that threatens all life on his beautiful but troubled planet." It's a coming-of-age story suitable for kids, but probably too complex for most mid-grade readers. I can also tell you that the main character is just a regular guy, there's no evil dark overlord, and it passes the Bechdel test in chapter 10. So what's next? I need to finish the second draft, get it read by some beta readers, get a professional edit, design a cover, figure out e-book formatting, start a mailing list, start a twitter account, and various other marketing activities. Oh yeah, and name the book. Wait, what? you say, don't you have to get an agent and/or send queries to publishers? Nope. I'm going to self-publish. Used to be you could either publish "traditionally" or use a vanity publisher. Nowadays many writers are choosing to self-publish. Some have success and move on to traditional publishing. Traditional publishing is dominated by "the big 5." The big publishers got merged and acquired by bigger publishers and so on until there's only five left. They don't give decent contracts to new writers, so the only reason to go that route is for the prestige. They do help some with marketing, but not as much as I thought before I started this journey. Anyhow, I'm joining the ranks of the "indie authors." Can you help? There are some things you can do to help. The easiest thing is to go like my new Facebook page. Another thing you can do is sign up for my email newsletter. I haven't automated it yet, but I can start making the list. The newsletter will probably come out 2 or 3 times a year. Another thing you could do, although it's much more of a commitment, would be to be a beta reader. Beta readers read an early draft of the book and provide feedback. I'm hoping to find a small but diverse group for this. Please email me if you're interested. I'm thinking that it may be beneficial to present as gender-neutral, at least at the start. It's become less common these day, but women used to do it all the time, because it helped get in the door with traditional publishers. But I thought I'd explain if you're wondering why I'm going with "IW". It's actually one way you can tell when I'm being my professional self or my regular self. Since I'll be marketing, and a surprising amount of author marketing for small-time self-publishers is personality driven and social media driven, I'll have to be careful as IW. Not only will IW lack a gender, they will not support sports teams or politicians. We'll see how long that lasts.